Do you recycle any of these items? Blue Planet II was crowned the most-watched show of last year - and it certainly led some of us to think about how we can do our bit to protect the world. People in the UK are being urged to do more to protect the environment - but many don't know where to start. Household waste is responsible for so much damage to the planet. Why not take a look at your rubbish and see what more you can do? 1.Toothbrushes: One of the most commonly used items in the home - and it can be recycled. Dentists recommend that you change your toothbrush every three to four months - so it's easy to make a difference every time you swap. There are different components of these products that can be recycled. The plastic holder and bristles have a variety of other uses when re-purposed. 2. Pens: Got an arts and crafts box filled with old and broken pens and highlighters? There are a number of schemes worldwide which help pens get collected and remolded into new products. 3. Mobiles phones: Instead of clogging up space in your bedroom drawer why don’t you recycle your old handset? You could gift it to a younger relative or earn yourself a few quid for your trouble by trading it in on phone recycling specialist website. 4. Carpet: If you are planning on redecorating make sure you don’t just don’t throw away that old carpet. Instead, find a carpet recycling facility near you to take it away for a new lease of life. 5. Old bras: No longer fit or wearing a bit thin? If they're no good to you, that doesn't mean they're no good for anyone else. They can be redistributed to those in need, or can be weighed up for charity. 6. 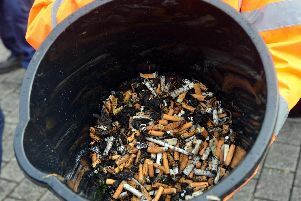 Cigarette butts: Want to be more conscious about what happens to your cigarette waste? Your used cigarette butts can be used to make industrial items - and leftover tobacco can be composted. 7. Makeup packaging: Check your favourite brands to see if the packaging is recyclable. Be warned - there might be rewards available, too. 8. Wine corks: Donated corks can be resold - with profits going to charity too. Some are also donated to various organisations for arts and crafts. 9. Tights: We all know how easily you can ladder a pair of tights. But don't give up on them that easily. They can be reused as cloths, strainers or protective sheets for plants. 10. Coffee pods: They've already satisfied your caffeine craving - but there's more they can do. Some pods are acceptable for collection by certain companies - and they could go on to become part of plastic baby bibs and park benches. This guide was put together by phone recycling specialist Envirofone. Ninety-eight per cent of the mobile phones recycled are re-used.